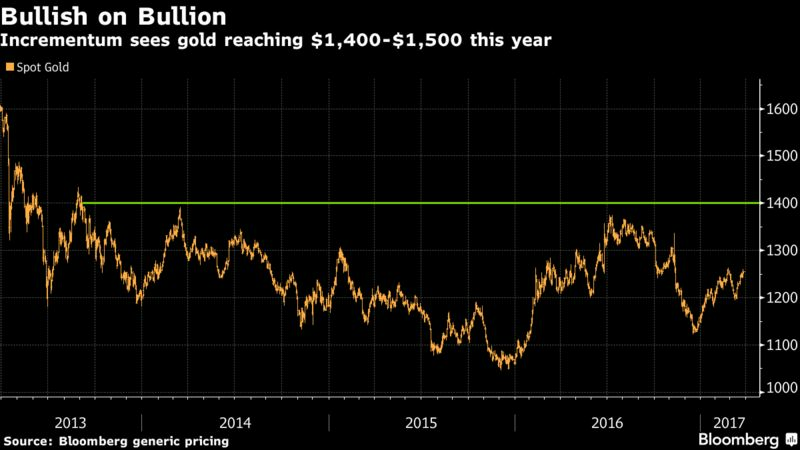 Gold is poised to rally to levels last seen four years ago as rising inflation and negative real interest rates combine to boost demand, according to Incrementum AG, which says that the precious metal may be in the early stages of a bull market. Prices may climb to $1,400 to $1,500 an ounce this year, said Ronald-Peter Stoeferle, managing partner at the Liechtenstein-based company, which oversees 100 million Swiss francs ($101.5 million). Spot bullion — which was at $1,249 on Wednesday — last traded at $1,400 in September 2013. Gold has climbed this year as investors weigh risks that President Donald Trump won’t be able to implement his agenda, adding to uncertainty surrounding European elections and the Brexit process. Against that backdrop, investors are on alert for signs of faster inflation, with the Federal Reserve’s preferred gauge jumping recently to near the bank’s target. Policy makers raised rates this month, and kept forecasts showing two more hikes in 2017. Bullion is traditionally regarded as an effective hedge against rising inflation, gaining in value to help holders preserve their wealth. While higher U.S. rates typically buoy the dollar and can hurt bullion, the commodity has advanced during previous hiking cycles. Trump’s recent talking down of the greenback’s strength should also be positive for gold, according to Stoeferle. Stoeferle manages 30 million Swiss francs in the renamed Incrementum Inflation Diversifier Fund, which he started in 2014 with partner Mark Valek. The fund uses its own inflation indicator, which is currently neutral to slightly negative. “As soon as we get the signal for rising inflation, we’ll invest in inflation-sensitive assets again such as silver equities, gold equities, energy and the broad commodity complex,” Stoeferle said. Not everyone is bullish. Societe Generale SA recommends selling on rallies as it sees gold declining amid further tightening by the Fed and only limited impact from political events. The bank has forecast an average of $1,125 in the fourth quarter. That’s is line with the outlook for $1,230, according to the median of estimates compiled by Bloomberg. Earlier this year, BNP Paribas SA — the most accurate bullion forecaster in the final quarter of last year, according to Bloomberg rankings — also sounded a note of caution. Bullion would probably decline as the Fed pursued rate hikes, keeping the dollar strong, the bank said in January. The Fed’s preferred gauge of inflation was 1.9 percent in the 12 months to January, just below its target of 2 percent. The Dallas Fed’s Robert Kaplan, a voter on policy this year, said this week he sees inflation and employment nearing the bank’s goals and continued to advocate gradual tightening. Fed decision makers including Chair Janet Yellen have repeatedly rejected the notion that policy is too lax even as the economy recovers, with inflation ticking higher and joblessness dropping. “I currently see no evidence that the Federal Reserve has fallen behind the curve,” Yellen said in early March. Consumer price inflation has been picking up in Europe, too. Euro-area inflation was 2 percent in February, the fastest pace since January 2013, according to data from the bloc’s statistics agency. In the U.K. the same month, inflation was 2.3 percent, reflecting sterling’s slump since the Brexit vote in June, as well as an increase in oil prices.